Tile is such a wonderfully useful product, isn't it? It comes in stone, ceramic, porcelain, glass, and more. It comes in all shapes, all colors, all sizes! You can practically put it ANYWHERE! We'll just come out and say it - We LOVE Tile! We've had many opportunities over the years to use tile in some unusual places. One place that is less and less unusual is straight up the kitchen walls. 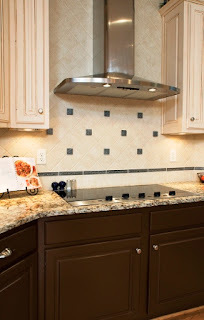 Take one look at the popular kitchens on Houzz and you'll see many homeowners doing what we have done for years - take the tile out of 'the backsplash box' and let it climb up, up and away. 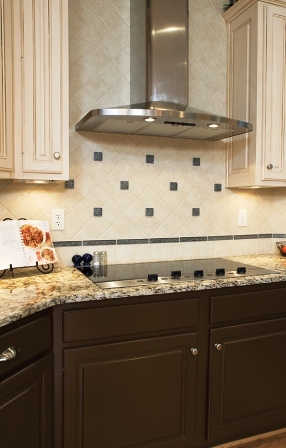 The beautiful thing about a backsplash is it protects the wall, allows for easy cleaning in an easily soiled spot, and it can add a "WOW" factor to a kitchen. Imagine what more of this tile could do, in the right designer's hands, to change the look of a kitchen! 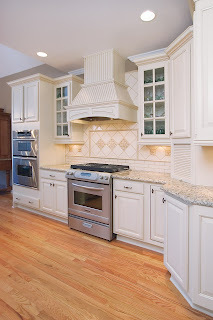 Here are a few examples of kitchens designed by AK Renovations, that were the pioneers of this tile trend!